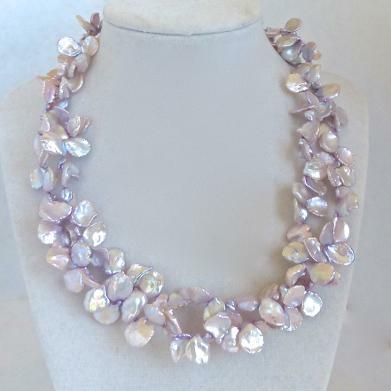 Double strand, approx 18 - 19"
I have made this necklace with a double strand of Keishi petal pearls that have a hint of pale burgundy in them. The pearls are approximately 10 mm across and a flattened but each pearl is slightly different. The inner strand (18”) nestles inside the outer strand (19”) and is finished with a large sterling silver clasp. This is a unique and gorgeous necklace. Keishi petal pearls are formed without a nucleus and are petal or corn flake shaped each one being slightly different. They are entirely nacre the iridescent lining of the shellfish in which they are made. Their value, like round pearls, depends on their thickness, size, sheen and color. These are visually very dramatic.